A quick reminder that we have a Great sale going on. ON SALE NOW10% off all Cardstock in our IVORY 8.5x11 CARDSTOCK CATEGORY. This is a good opportunity to jump on board and purchase those staple items. I also wanted to let you know about something I am super excited about......... We will be carrying Core'dinations Cardstock !!!!!! Lot's going on here folks. Someday days I don't know whether I am coming or going. However we have so many wonderful things in store for you guys. Are you looking to simplify your print work. Well we may have the perfect item for you. We are now carrying some wonderful Avery packs. We are also carrying some Beautiful Neenah Classic Linen Paper and Cardstock. Don't forget that all of our A7 Envelopes are on sale till the 31st. This is a great time to stock up for the Holidays and any Special Occasion. 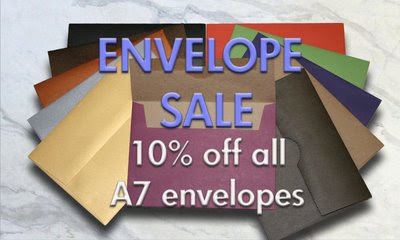 This month all of A7 Envelopes are on Sale! I am super duperly excited to write up this post today. I have met one of the sweetest ladies in this industry. She clearly (hehehe) is a fantastic artist with one super Design Team. Today we are spotlighting the work of Clear Artistic Stamps Design Team and the Owner Belinda Landtroop.